We’ve all heard the insurance claim horror stories I’m sure. What seems simple and straightforward, turns into an absolute clusterf**k once the chips are down! Here’s my story so far; lets hope common sense prevails! Friday the 22nd of July 2011 was a slow rainy day. As we do from time to time, some of us at work decided that being a rainy Friday, it made it a perfect candidate for fish’n’chips, so after doing the rounds for orders I placed a call to the shop and then headed into Clive to pick it all up. The rain had eased and was more of a drizzle now, so while still wet and not fun to stand in, visibility was pretty good for the short drive. After picking up the order I jumped in the car and headed for the office again. Southbound just into the 100km stretch of SH2 I started to accelerate as I came onto the first small straight, and noticed a white car on the opposite side of the road, but pointing in the same direction I was with its nose nudged slightly to the oncoming lane. It looked like it was parked, except that it was too close to the road, especially as it was facing the wrong direction. And sure enough as I got closer it pulled across the oncoming lane and tried to pull into my lane… the only problem being that my car was occupying that space already! The white car hit mine, we got the cars off the road, inspected the damage, exchanged details etc, and as the cars were both still drivable, went our separate ways. While I felt pretty pissed off at it all, I was glad at least that she hadn’t tried to say it was my fault and hoped that things could just get repaired and back to normal. Upon arrival back at the office, the rest of the team started on lunch, while I spent the better part of 20 minutes on the phone with my insurance company (State), relaying the information I had collected from the driver of the other vehicle, and giving a detailed description of what happened. This included the drivers comment that she had “misjudged” how close I was and that she had intended to move over to the southbound shoulder, wait for me to pass and then pull out behind me. Unfortunately while on the phone, the lady I was speaking to had tried the cell number without response so a quick effort to get her admission of responsibility wasn’t going to play nice, but State would continue to work on getting in touch with her. The lady also assured me that as I had Full cover plus hire car cover with them, that while my car was being repaired they could arrange a hire car. Great, wonderful, glad to know the dosh I fork out each week might actually pay off! A short while after I got off the phone with the insurance company I took the car into one of their preferred repairer’s for assessment which included nothing more (and I mean NOTHING more) than a couple of photos of the damage; no questions, no further investigation to see if it was more than panel damage etc. But that’s fine, I figure they know what they are doing and I’m certainly no mechanic to question their process for such an initial assessment. So everything should be good… In a perfect world at least. My concern was raised the following Tuesday when mid morning I received a call on my cell asking to speak to … the driver of the other car! After a bit of back and forth, I established that they were returning a call she had made to them, and somehow the cell number had got mixed up by the return caller. I thought that while the mix up was a little concerning, at least they were getting to talk to her to get things moving along further. Silly me! Tuesday afternoon, after hearing nothing I phoned the insurance company again to enquire about the status of my claim, only to be told that the driver of the other car was not admitting liability for the accident and that both she and I would receive in the post some paperwork asking us to give a written statement and a diagram. At this point I started to get a little more pissed off; I was driving a car that I couldn’t open the drivers door properly on, and that had developed a lovely little shake in the stearing that resulted in me deciding that I wasn’t willing to drive it to Wellington the coming weekend for fear it would crap out while in transit somewhere far from home! So on the 1st of August the letter finally arrived and today (the 2nd) I filled it all out and emailed it to them this evening. The more I wrote, the more pissed off with it all I got. Excess aside, they still haven’t got my car fixed; what would happen if it wasn’t drivable? What if there is as yet unseen damage that is going to result in additional damage or failure, of the steering for example! I decided to put it all on here and vent my frustration to the world. I’ll also be asking some rather pointed questions about other aspects of my policy to the insurance company to see what they have to say, and ultimately will decide if I want to stay with them or if I want to change. The following is the email I sent to them and the accompanying picture. For now I won’t put any identifiable details about the other party in here, but who knows, that may change depending on how irritated I get before this whole thing is over! The following statement and attached pictures are in reply to the letter dated 26th July 2011 from <The name of their “Claims Consultant”> requesting further information in relation to claim <Claim Number>. At approximately 12:30, Friday the 22nd of July I was travelling south bound from Clive returning to work in Whakatu. The weather was overcast and had been raining heavily, however there was only a light rain and good visibility at the time. As a matter of habit I had my headlights on to increase my visibility to others with the sporadic rain that had been coming. When the accident occurred I had transitioned from the 70km/hr to the 100km/hr speed zone and started to increase my speed as I came into a straight section of road. As I entered the straight I noticed a white car on the opposite side of the road facing southbound (the wrong direction for the side the vehicle was on). Once I gotten closer that car began to move forward onto the road, crossing the oncoming lane and heading for my lane. I was forced to move left off the road and did so as much as I could without moving into the muddy siding and risking total loss of traction; I also applied the brakes and sounded the horn as I did so. The white car continued and impacted my drivers side front door and front panel; it also bent my wing mirror in. After both vehicles had come to a stop, the white car was in the southbound lane and had pushed my car off the road even further. In order to avoid a further accident I moved my car left and forward to allow both cars to get off the road. The driver of the white car seemed very concerned and apologetic. We inspected the damage to both cars; I’d had difficulty opening the drivers side door on my car and notable bending had occurred on the impacted panels as well as damage to the front drivers side tyre. Her vehicle showed little noticeable damage however the bright white paint and overcast day made it hard to distinguish any minor deformities that had resulted in the accident. 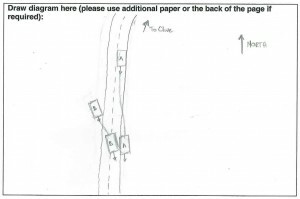 At the scene, she apologised and explained that she had misjudged how close I was when she pulled out, and that her intention had been to pull her car across both lanes and onto the south bound shoulder, allowing my car to pass before pulling out behind me. It seemed clear from her comments that she acknowledged that it was her misjudgement that had resulted in her hitting my car and I took this as to an acknowledgement of liability. Due to the apparent agreement on the cause and the fact no one was injured and that the damage appeared relatively minor (both cars were still drivable without significant risk) I opted not to ask Police to respond. After exchanging details and inspecting my car to ensure it was not likely to do too much more damage driving the remaining few minutes to work, I returned to the office and called State to report the accident. Logs indicate this call was made at 12:42pm. After loading the claim, I took the vehicle to Napier Collision Repair for an assessment, during which they took photos of the visible damage. Since then having had to drive my car in its current state I’ve also noticed that there is now a shake in the steering that I can only attribute to being shunted in the side by another vehicle. Access to the drivers compartment is still restricted also, due to being unable to properly open the drivers side door. On the morning of Tuesday the 26th I received a call on my cellphone asking to speak to <the other driver>, which is the driver of the car that hit mine. There had obviously been some confusion as someone at State was apparently returning <her> call and had for some reason mixed my number up in the process. That afternoon after hearing nothing back and growing more concerned as to what other details may have gotten confused, I decided to follow up with State at which point I was told that <she> was not admitting liability and that although I had given a statement and description over the phone I would now be required to give one in writing along with a diagram. 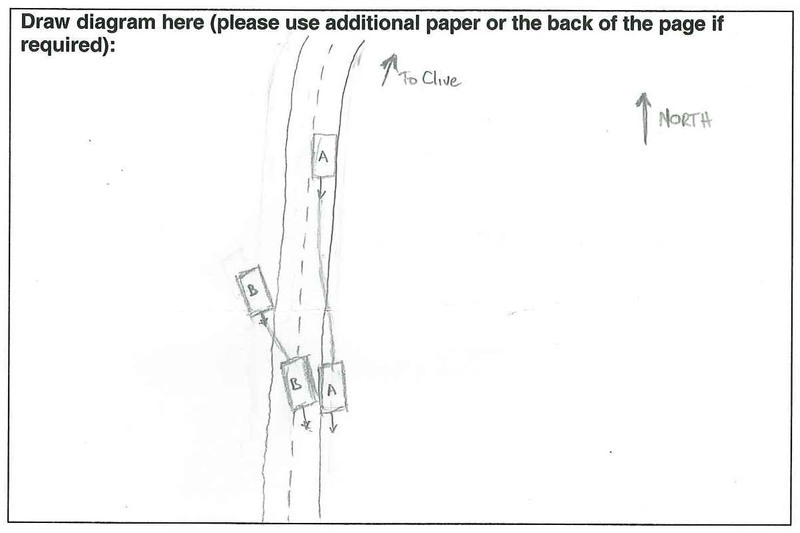 The accompanying diagram shows the relative position and movement of the two vehicles both before impact and at the point of impact, with vehicle A representing my vehicle, and vehicle B representing the other vehicle. Both vehicles were pointing in a southbound direction with vehicle A approaching in motion along the southbound lane, and vehicle B beginning from a stopped position facing the wrong direction on the northbound shoulder. From here, vehicle B moves across the northbound lane and merges into the front right hand side of vehicle A (my car). At the time I was traveling somewhere under 100km/hr as I had only just entered the 100km/hr zone and following a brief period of acceleration had started to slow my speed (prior to reaching 100km/hr) as a result of recognition this hazard unfolding. Please feel free to contact me if you wish to clarify any further details. I trust that this provides sufficient information to allow you to make an informed decision as to the liability for the accident allowing the claim to progress. So what do you all think? Had the same trouble yourself? Feel free to name and shame (or complement if appropriate) your insurance company, as I’ll be shopping around again in the near future! The thing is they have only called me once, i spent a week ringing them daily, every coupe of hours trying to get through, but to no avail. I finally got through to them and apparently I was waiting for them to get in contact with the other party, about a month after the crash, where I rang them about half an hour afterwards. in saying this tho, Mum had a crash about a month and a half ago, Insured under the same insurer (probably the same policy if that is possible) and they sorted it in a couple of days, fixed the problem, and I think sorted out everyone elses cars out too.. so who knows, it might be who you speak to, or the panelbeater, or how grumpy you get at them!! !